It isn’t very often that I come across a product which falls into the ‘hero’ category, however, the Clarins Double Serum* has done just that. I have been using this now for roughly six weeks every single day both morning and evening and I cannot begin to tell you just how much I love it. It really has made a notable difference to the look of my skin, so much so that I feel like I want to tell everybody about this product. Clarins is one of my favourite brands when it comes to skincare and lip products in particular, I still to this day adore the Instant Light Lip Perfectors. Having never tried the original version of this I am unable to compare it against that, however I do know that this latest version contains no mineral oil, whereby instead it has been introduced with turmeric which is well known for its anti-ageing properties. 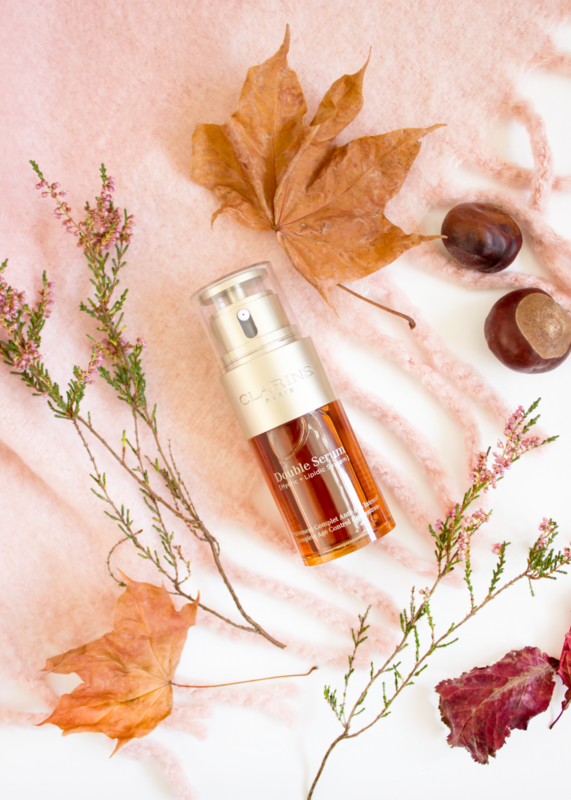 The Clarins Double Serum* is a complete age control concentrate which works on the five important functions of the skin, those being hydration, nutrition, oxygenation, regeneration and protection, helping to encourage a more youthful and radiant complexion. This is aimed at all skin types, however the only thing I am unsure of is as to what age it is really aimed at. I myself will be hitting 29 this year and definitely now find myself looking at products which offer anti-ageing. 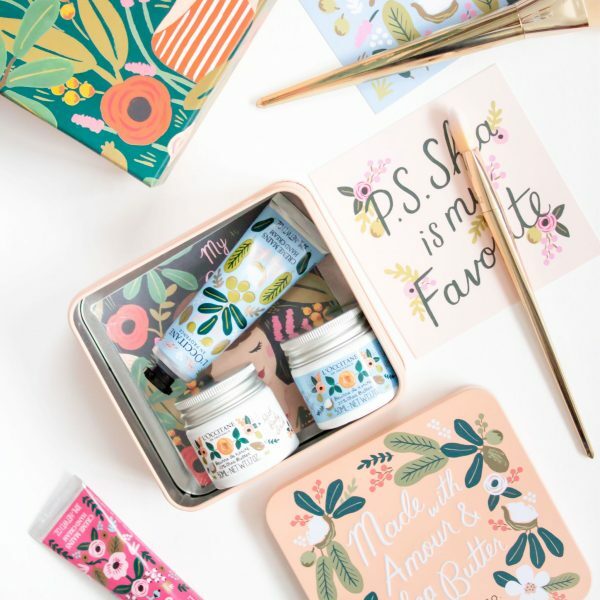 I don’t smoke or drink very often at all so there are no major aggravating factors, however I do live a very busy and stressful life, therefore I can’t help but think it is important to use an anti-ageing product if I can. The packaging of this serum is one of my favourites to date. It is so easy to use and I have found that the two select options on the top of the serum is perfect, it allows you to twist the lid in order to control just how much you dispense which is perfect if you can be a little bit trigger happy. I always have mine on the lowest setting as I find that this is just enough for me. The serum itself is orange in colour and applies over the skin without any of the colour being apparent. It never leaves my skin feeling greasy at all, it doesn’t really have an oily texture to it, in fact it is much lighter than that yet it always keeps my skin hydrated and looking fresh. As mentioned above, I have been using this both day and night and have seen such a positive result in my skin. It is clearer and much more hydrated, yet the most noticeable thing I have picked up is how much more radiant my skin actually is. I actually look refreshed which I can assure you is no mean feat. It has been a very long time since a skincare product had such a positive impact on my skin. 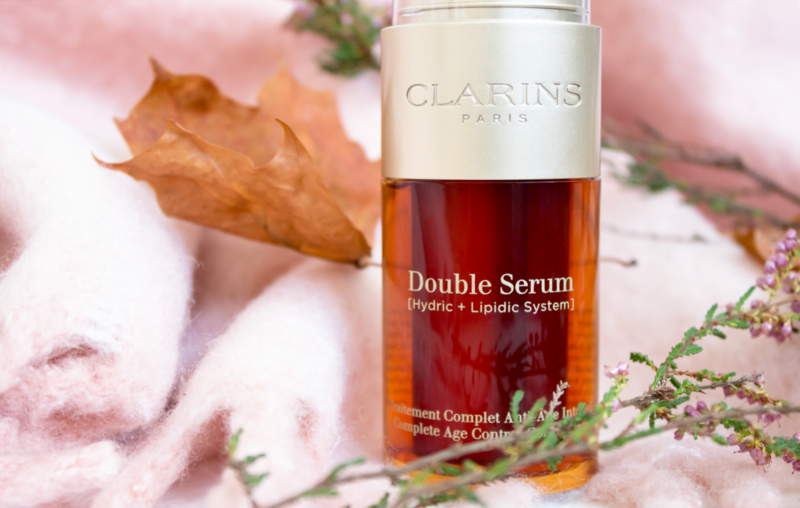 The Clarins Double Serum retails at £57 for 30ml which I know is not very affordable, however, I already know that when it comes to it, I will pick it up in store. I am not too sure if I can now be without it. The Clarins Double Serum can be found on Clarins and Boots.